For marketing planning, it’s always wise to pay close attention to trends and strategies in the fashion industry as it tends to have to adapt quickly and stay ahead of the curve. With the nature of how fashion works, the industry has to change faster and responds quicker to trends than other verticals have to. Whether or not your brand is in fashion, this is a great post for all marketers who want to ramp up their digital strategy since there are many takeaways for all industries here. The iconic Coco Chanel said, “In order to be irreplaceable, one must always be different.”, and there’s a lot to learn from that statement. Every brand wants to be considered irreplaceable, and in this dynamic, the pressure to be always different can be enormous…and time-sensitive. It’s sometimes not enough to be quick to react to the present trends; you need to be ahead of them. This is quite a daunting task for the designers, who have their own type of amazing creative genius to stay on top of. Almost as challenging as implementing designs that are ahead of the game is getting your fashion brand’s marketing campaigns to have that same lightning-quick intuition. Gone are the days of waiting for the inch-thick spring edition of the major fashion magazine to declare what to wear that season. The fashion industry is moving way too fast now. So, how do you get your brand in the race? 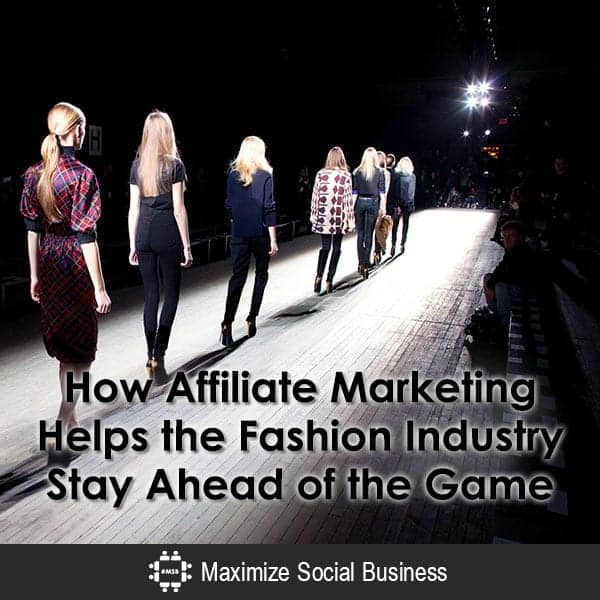 The same way all the biggest fashion designers do it: with a powerful and knowledgeable affiliate marketing plan. Most of the world’s biggest (and newest) fashion houses are using a multitude of marketing strategies to get their brand out there. Just last year, activewear giant prAna used a clever and interactive clever and interactive challenge to highlight their versatility and style. Online methods are working extraordinarily well and according to this study, online sales are predicted to rise more than 41% this year alone and affiliate marketing is a cornerstone of digital marketing, with an almost guaranteed return on your investment. Take the story of Burberry, for example. This venerable London fashion house was founded 160 years ago, known mostly for its outerwear, handbags, and scarves with their distinctive signature check pattern. They have over 500 stores all around the world and are considered one of the premier luxury brands. During the economic recession in the 2000’s, however, luxury brands were taking quite a hit, and Burberry decided it needed a change. They decided to devote themselves to becoming almost entirely digital and to aggressively enter the social media sphere in 2006, at a time when not many brands were taking that sort of risk. Through carefully curated content, hand-picked affiliates and engaging and interactive communications, they refined and simplified their approach and focused on the younger generation; a generation that clearly did not have the buying power that their parents did. What this generation did possess was a savvy social presence and the willingness to share their experiences, and Burberry’s new strategy lined up perfectly with that. They were also the high-end fashion buyers of the future, so this was a target group that would impact the brand for years to come. By using influencers to highlight the brand and build trust and affiliates to drive the bottom line, Burberry has become the 4th fastest growing brand in the world (behind Apple, Google, and Amazon). Pretty esteemed company for a 160-year-old brand, no? Now, we’ve seen how established companies can use these marketing strategies to reawaken a classic brand. But what if you’re a new brand, just trying to get your foot in the door? Your vision is sky-high, but your marketing budget is pretty slim…if you have one at all. What’s the plan? Well, believe it or not, it’s not that different from the big brands like Burberry. Establish your brand’s identity, do your homework and carefully identify a few people to check it out. If they are a good fit, they talk about it to their followers, and word starts spreading. A few take some great Instagram shots, maybe a couple of blog posts pop up, and now it’s starting to get some momentum. People are getting a good look at your brand, and lots of eyes are on these websites. What’s the next step? There are quite a few options for your brand to ramp up your digital strategy, and having a good affiliate program gives you powerful influencers and an actionable plan. In addition to being able to keep your brand visible and accessible on well-traveled and expertly targeted websites, an affiliate program will give you the ability to have a level of creative control over your content and identity…all while letting professionals handle the business at a level and cost you’re comfortable with. Affiliate programs don’t just sell, they promote brand awareness and can create a buzz that direct advertising can’t provide to consumers who are now blind to traditional advertisements. When brands have the right partners who are authentic and align with brand values, promotions, coupons, and other deals can drive traffic to your site in an organic and natural way. Obviously, there is plenty of work involved, however, if you are managing this system. Tasks like selecting and building affiliate relationships, deciding what and how to pay them, following FTC guidelines and keeping everything updated and current are necessary every week. If you have the extra time and know-how, then it’s absolutely something you can do yourself. But, if you’re a designer and business owner, it’s likely that your time and effort are better served in other departments. If so, you might want to consider investing in an experienced affiliate marketing company. They can handle all the details, so you can keep your eyes on everything trending. Are there any affiliate marketing examples that inspire your strategy? Please share in the comments below and reach out any time for co-collaboration or affiliate marketing questions! Great read!! Thank you. My fashion house has just released an affiliate program for their luxury brand. I’m currently doing some research on this and this was some really helpful information.